Tuesday, Oct. 30, 2018, 4 – 6 p.m.
Public scholarship and public outreach is an important goal for the Center for Environmental Politics. In collaboration with the Earth Lab, the Center for Environmental Politics is launching a new initiative: "Doug and Maggie Walker Environmental Conversations" to honor the tremendous impact both of Doug and Maggie have had on practical aspects of environmental policy locally, regionally, and nationally. The Conversations will feature prominent environmental leaders/practitioners who share their perspective on real world environmental policymaking. 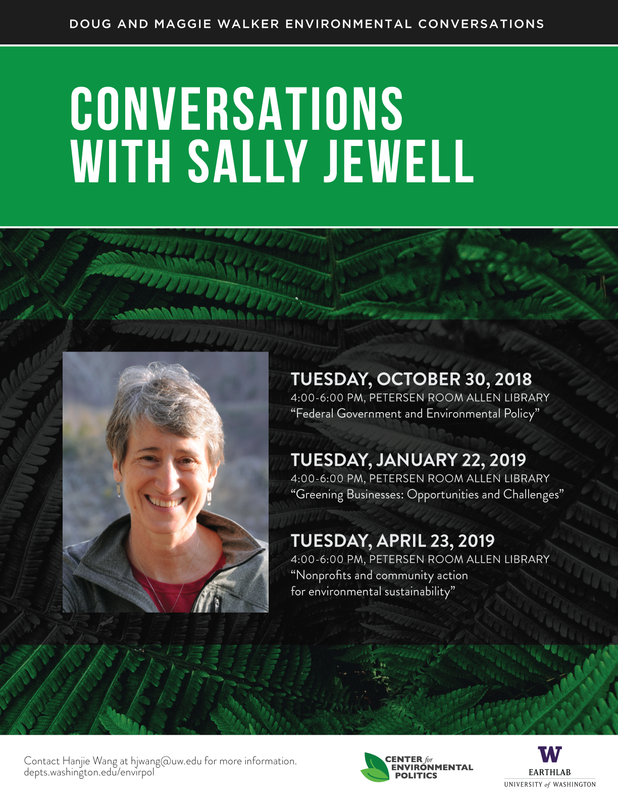 In 2018-2019, in collaboration with the Earth Lab, the Center will host three such “conversations” with Sally Jewell, drawing on her experience in the government, the for-profit, and the non-profit sector. Sally Jewell served as U.S. Secretary of the Interior under President Barack Obama. Before serving as Interior Secretary, Jewell was President and CEO of REI. She is currently a Distinguished Fellow at the University of Washington College of the Environment. All Environmental Conversations will be held in the Allen Library's Petersen Room. A light dinner will be served at 4:00 pm, followed by Sally's presentation and Q&As. The event is free, but given the limited seating capacity of the Petersen Room, a system will be set up soon to reserve your seat.